I’m a big fan of long-form direct response copy. No surprise there – I’m a direct response copywriter. In tests, long-form direct response copy performs better than short copy … especially when selling expensive items. A couple of long-time truths about long-form copy. Copy needs to be as long as it needs to be. Direct marketing copywriters must be given the width to write as much as they need to write. It’s not always possible with direct mail – especially when someone has a budget. But online, there’s no limit … just testing. One (usually) forgotten key to success with a long-form sales page is making it readable for the scanner. These elements tell me what’s going on as I’m scanning. After scanning, if I’m interested in the product or service, I will read every word, especially if the product is expensive. There’s nothing wrong with direct response copywriters writing a lot of somewhat dense copy. But the reader must be able to figure out what’s going on just by scanning. When you need guidance, look at newspapers, magazines, and news-oriented websites. These are generally brilliant at making copy readable for the scanner. One was 30,000 words; the other was 12,000 words. That’s 42,000 words and the literary world has produced shorter novels. Reading these two behemoths reminded me of how potential buyers look at sales pages and how copy should be organized. For both pieces, written by top copywriters, I looked at the headline, the deck, and the lead, and looked for how much the products cost. Once I had a sense of the price, sorry…investment…I started to read the copy. The first time around, I looked mostly at the subheads. Then, because I was extremely interested in the products, I read every word of the copy. It took a while! What I was going to get. If the listed features and benefits were going to solve my problem and produce an ROI. I was also interested in the guarantee in case the products turned out to be poor. So…here’s what we can we discover from this experience. The headline and deck must quickly and clearly spell out the clear benefit and the product. It’s not a time to be clever. It’s a time to be straightforward, lucid, and clear. If people are genuinely interested in the product or service, they will instantly look for the price. If the price is high, then having a “three easy payments of” option is important. There must be TONS of copy to justify an expensive purchase. Pay close attention to the subheads. These should be every bit as strong as the strongest headlines. It’s unlikely that someone will sit down and read every word of long-form copy right away. But, to justify an expensive purchase, they will read every word—especially when it comes to key features and benefits…plus the full description of what you get. It’s sort of like car buying. Some people will buy a car because they like the color or the stereo. Others will buy because of the engine’s torque and/or efficiency. Others will buy because of the payments. Others want to know everything they can discover. The advertising for the car has to provide information for every type of buyer. 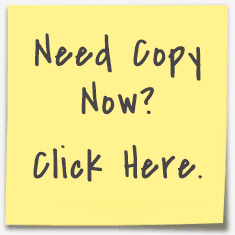 Strong long-form copy written by a long-form copywriter will satiate every type of potential buyer. And yes—I bought the two products…persuaded by the long-form copy written by a top direct response copywriter.